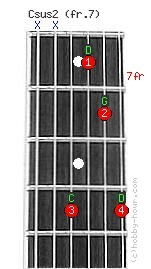 Chord Csus2 (7th fret) notes: C, D, G and D. You must leave out the 6th and 5th strings. Csus2 - C suspended 2nd guitar chord is often noted with non-standard names like C5add2, C2(no3) or C2. Sometimes it's referred to as Cadd9(no3).